Absolutely beautiful, prepare to be blown away the second you hold this replica shield. Flawless painting and style on this shield makes the experience come alive on your arm. This shield is multi-purpose! 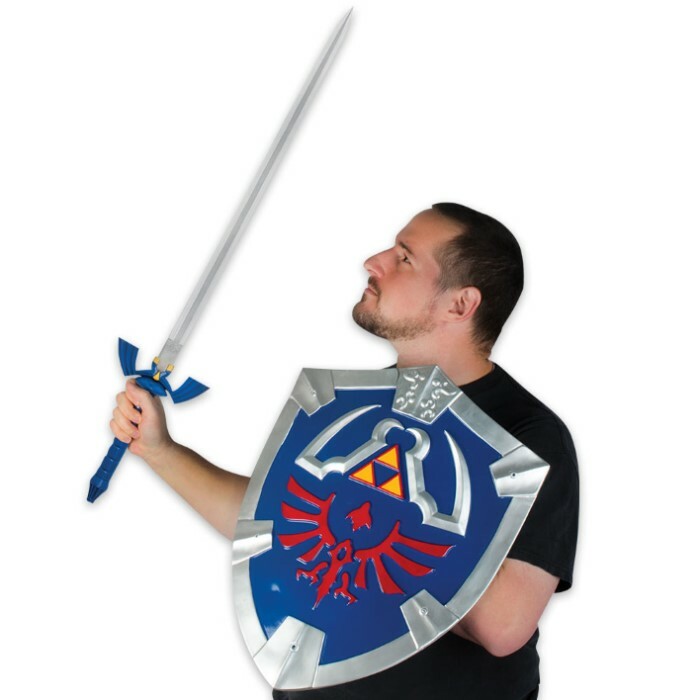 It can be mounted on the wall, worn on your arm, and can even hold a sword while wall mounted for the ultimate display! Full size, the thickness ranges from 1/2 to 1 inch while remaining light and maneuverable. Includes mounting chain, arm band, and handle. Looks good the arm strap and handle are annoying to put in but it hangs on the wall anyway have master sword to go with it together they look good. Doesn't have a steel look I was hoping for but I like it. Overall this shield is an amazing piece of work, nice paint and a good solid feel to it's construction. I got this for my sister's boyfriend as a Christmas gift but unfortunately the packing it came in was trashed. I had to open up the actual package to make sure everything was okay with the shield. Took me a while to find a piece of the handle because it had fallen out of the shield's box and into the packaging without me noticing. Overall this is a great piece for any Link or Legend of Zelda fan, and I am hoping that the absolutely terrible state of the package was from the postal worker not from someone at Budk cause I love you guys. The shield looks pretty much as pictured, about 2ft in height and about 16in wide. The passing job is just above okay, might need some touching up. It smells terrible, mine smelt like hydrogen peroxide. It was tough getting the handle in, had to unscrew the parts to put the handle in. I can't get the strap to stay, it always falls out (just hooks holding it in place basically), I'll have to try and fix that somehow. Overall, it's a nice shield with a few small imperfections. It took my six year old an hour to break. I hit it with a rubber Zelda LARP and the paint scratched. The screws stripped out. A wall hanger only. If you play it will break. Spectacular Piece! It looks just like it came out of the game into your hand, honestly. It's sturdy, stunning, and affordable. The paint is a little bit off in some places, but only if you -really- look at it, and it's hand painted, so you can't really complain. 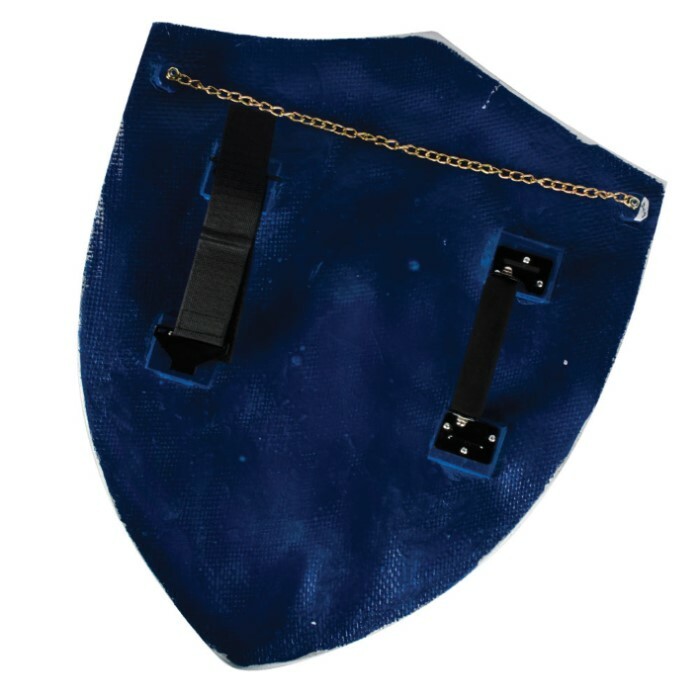 The strap to hold your forearm is velcro, and it's a bit uncomfortable, but it's easily replaceable if you want to hold the shield comfortably, and the handle is great. The price is amazing for the quality - this shield looks spot on, and it demands attention. It's lightweight, likely either wood or fiberglass, so you can hold it for cosplay or light use. Don't use it for hard contact, you might break it! All in all, a fantastic iconic piece that any Zelda fan should have, and Trueswords's service is once again fantastic. This thing has some weight to it, but it is still cool as all hell. It is sturdy and great to look at. Great piece for the man cave. Most of all, I would like to thank True Swords for being a honest seller, unlike some other sites. Where you place a order and never get your items. I had originally purchased this as a Christmas gift to a friend, along with the Master Sword replica from Trueswords as well. 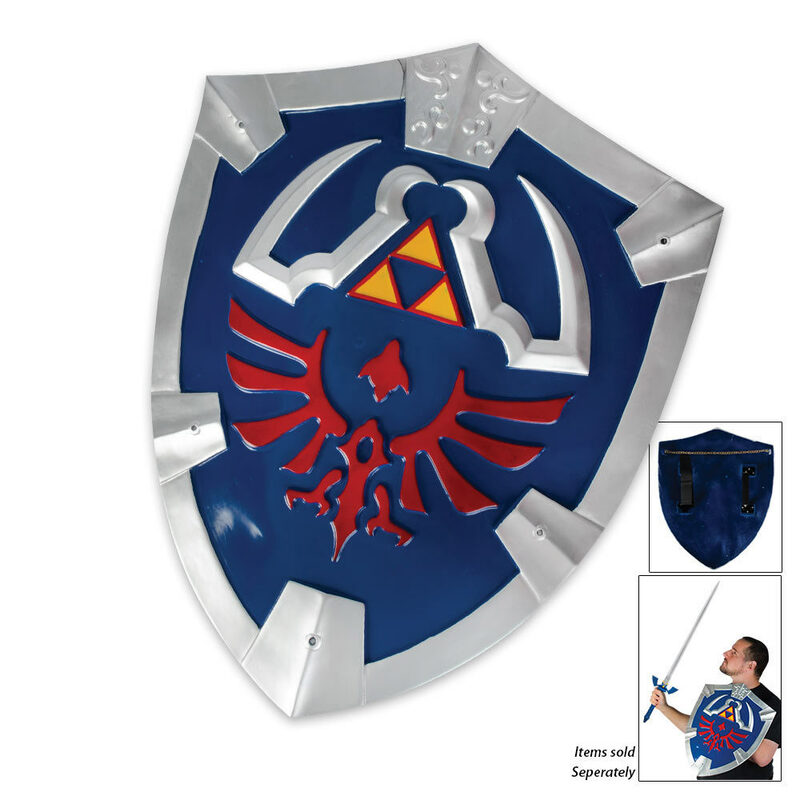 The Master Sword was perfect and looked amazing, however during shipping, the shield was damaged. I contacted Trueswords to find out how to receive a replacement, and got a reply much quicker than I had expected. Long story short, Evan Johnson, the person helping me through email, was with me every step of the way. They sent me a brand new shield that was packaged amazingly well and was not damaged in any way. The new shield's paint job was quite a bit better, and there were no dents or cracks in the shield from shipping. The shield looks amazing, and is a very decent weight (Not to light that it feels really cheap, and not too heavy that it'd be impossible to hold for an extended time) So to Evan Johnson, thank you so much for all the help and great customer service. To Trueswords.com, I've never purchased replica swords or sword-type products from any other website before, but because of this event, I know I never will. Trueswords.com is definitely where I'll be spending my money any time I'm looking for a new sword display. all in all its a great buy but if you do buy it for the love of god dont actually use this shield, its not made for it.